The Serie A side have yet to agree a fee for Jorginho, but Aurelio De Laurentiis expects the transfer to go through. 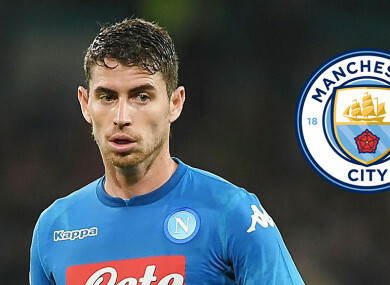 NAPOLI MIDFIELDER JORGINHO is expected to sign for Manchester City “in the next few days”, according to the Italian club’s president Aurelio De Laurentiis. After previously claiming to have rejected a bid worth €50 million, De Laurentiis said City are moving closer to his valuation of Jorginho and gave a positive assessment of negotiations. “I think the deal can be done in the next few days,” De Laurentiis told Sun Sport . “Everything is possible as we have a good relationship with Manchester City and their people but we must negotiate. Email “Napoli star on the brink of Manchester City move despite €50 million rejection”. Feedback on “Napoli star on the brink of Manchester City move despite €50 million rejection”.